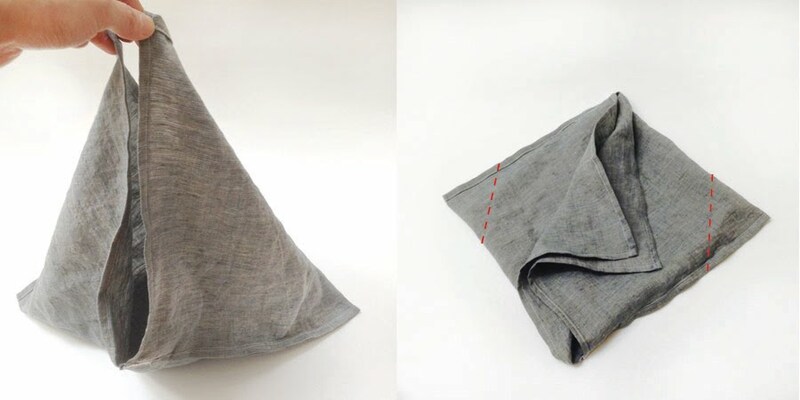 This is a super easy project that you can sew in a couple of hours or less! Cut one piece of fabric 10"x 26.5". 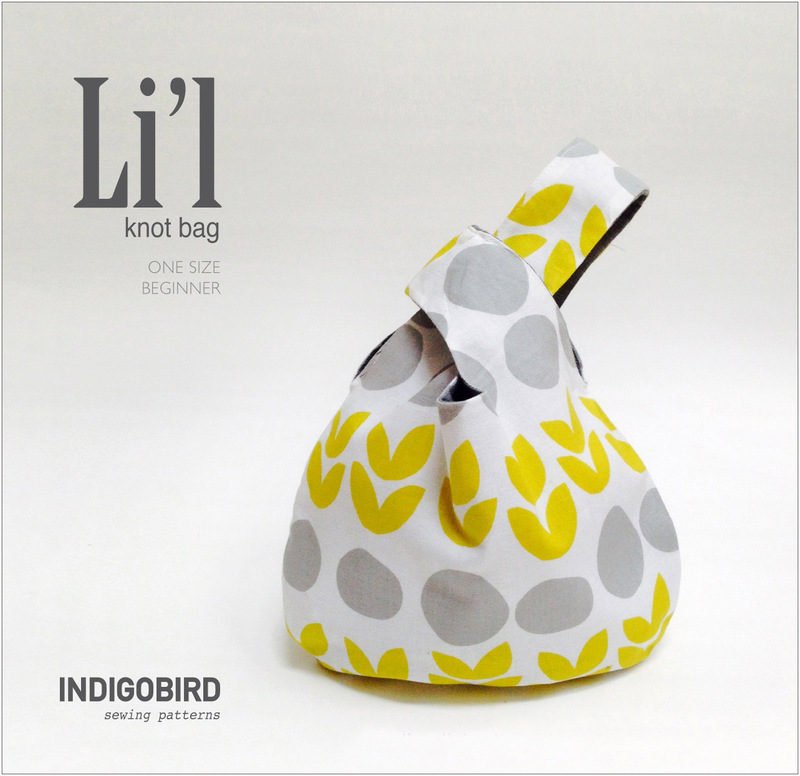 It's a good idea to use a linen or linen/cotton blend fabric for this project because both sides will be visible. 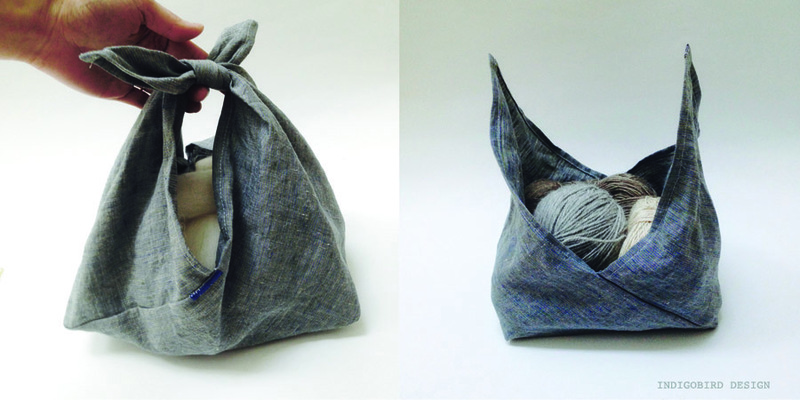 I used linen for this project but Robert Kauffman's yarn-dyed fabrics work beautifully too. 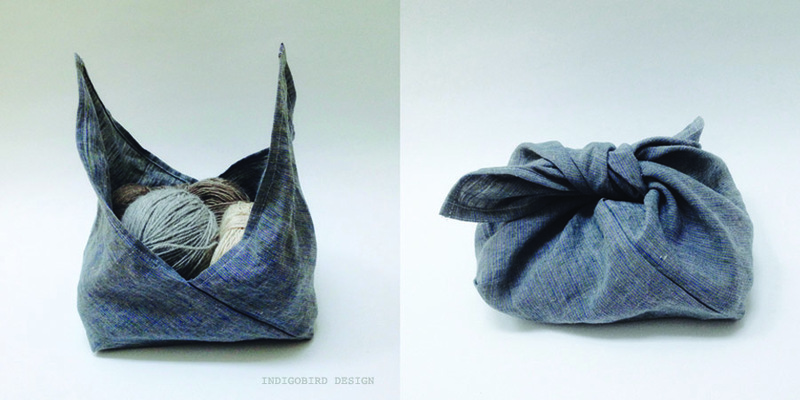 The finished size is approximately 7.5" x 5" x 10h (to the tip of the bag)". Cut fabric to size. Place the wrong side of the fabric facing up. Fold the raw edge 1/4" towards the wrong side of the fabric and press. Then fold it towards the wrong side again, hiding the raw edge, and then press. Do this for all sides. PLEASE BE PRECISE WITH FOLDING. If measurement is off then, the bag will end up crooked. 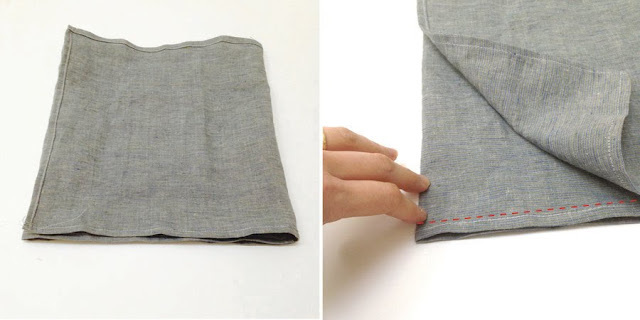 Sew all the way around close to the folded edge. Lay the wrong side of the fabric facing the floor, right side up. 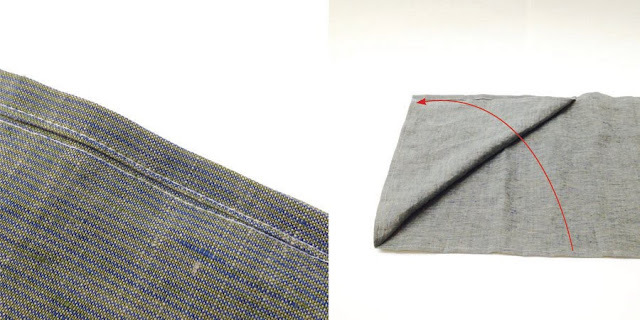 Then grab the left end of the fabric and bring it about the third way towards the right. Now bring the right side of the fabric over to the left. Now you have three layers of fabric with wrong side facing up. Lift up the first layer and sew along the remaining two layers together right along the seam line. Sew as close to the seam as possible. Then turn the fabric around so that the sewn edge is facing away from you like in the picture and bring the corner of the fabric towards the sewn corner, forming a triangle. Now overlap the fabric as before. 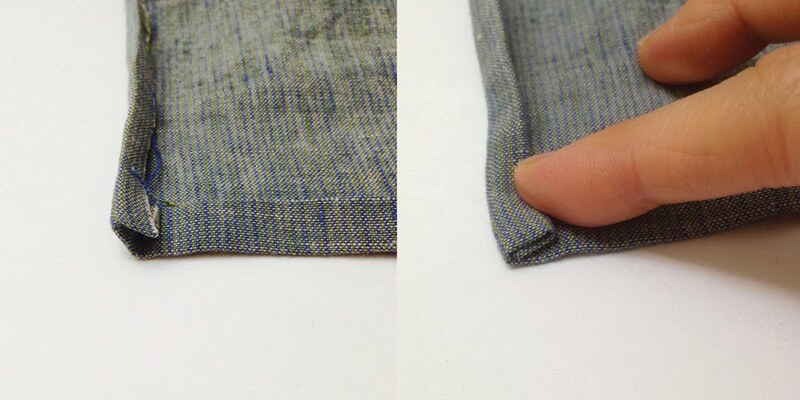 Now you are going to sew these two layers together along the seam. Basically, you are peeling off the middle layer so that it's out of the way while you sew the top and the bottom layer together. If you did correctly, it should look like this when you turn it right side out. At this point, you can do a decorative accent at the centre as shown. Turn the bag inside out again so that the right side of the bag is on the inside. 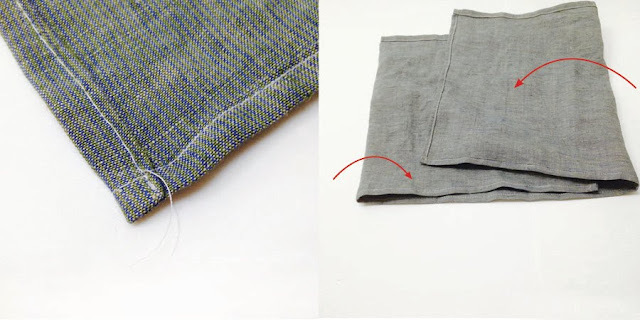 Grab the corners up and gently drop them to the centre so that you can work on the gusset. It's up to you how much gusset you want to create. For 9"x27" bag, I made a 5" gusset across. That's it! Turn the bag right side out, and voila! 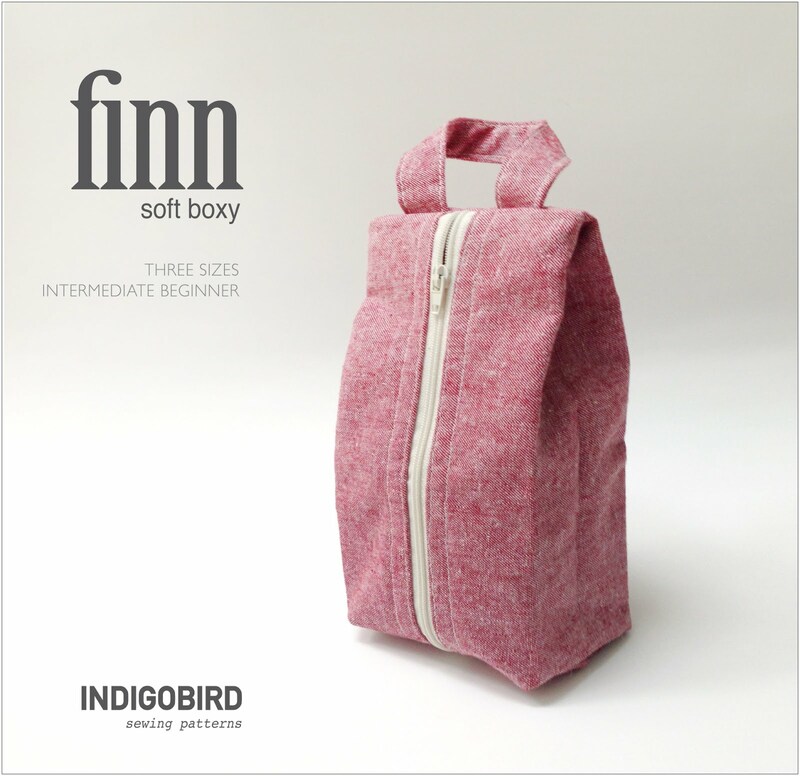 You will be surprised at how roomy the bag can be. 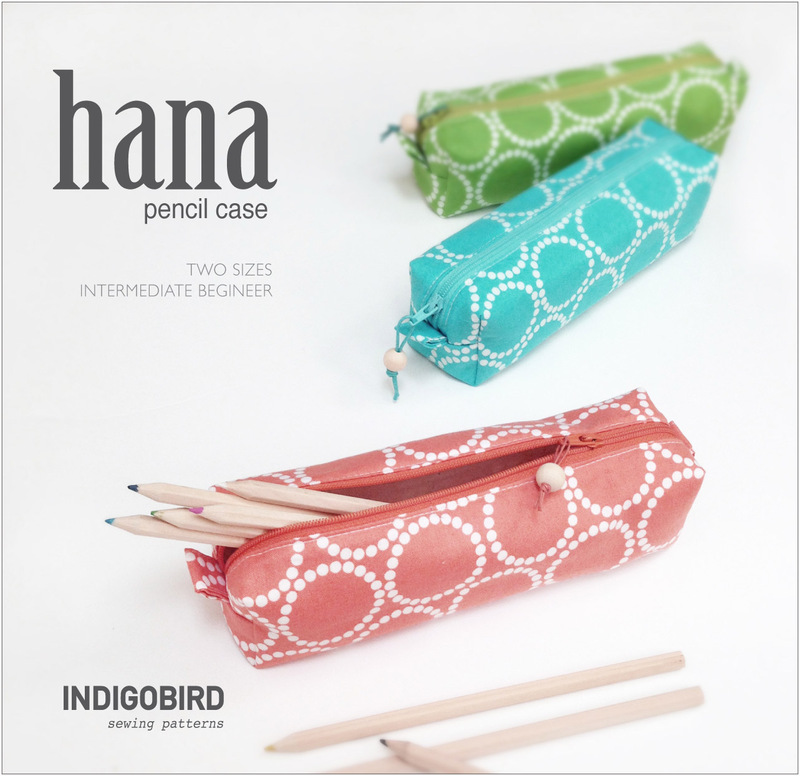 so simple, so beautiful and so usefull. HI! I love this idea, and have made several bags. Now, I have found the last two have come out imbalanced. What am I doing wrong??? The only thing I can think of is that your measurements may be a little off. 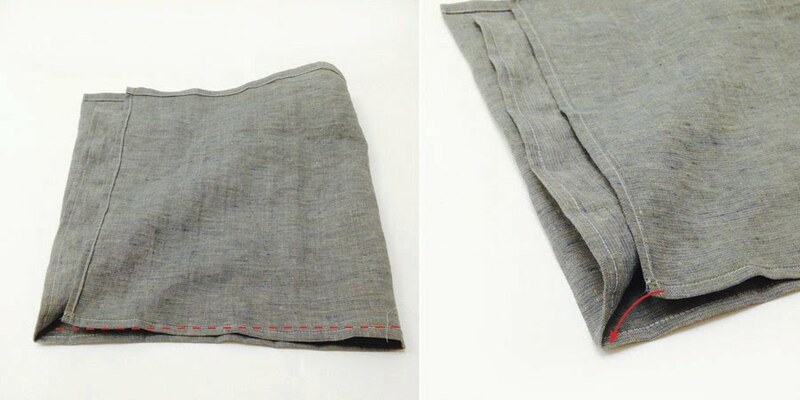 After hemming all sides, the short side has to be exactly 1/3 of the length. If not, the bag may come out a bit skewed. I hope this helps. If I would like to put a lining in the Bag, do I have to follow the exact same steps and sew the two pieces together or work them all at once? I would work them all at once. There are two ways to line the bag. One method is to sew the two fabric all the way around, right sides together, leaving a little opening for turning it right side out. Once right side out, sew opening shut and you can proceed to the step where you fold into thirds. I just took my first sewing class last night and was able to make a small and large bag based from your pattern today!! Thank you so much for sharing this with us! Just found your website through Etsy. 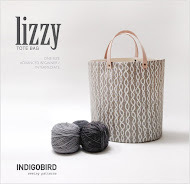 Beautiful patterns you have here, and beautiful fabrics in all of your projects! 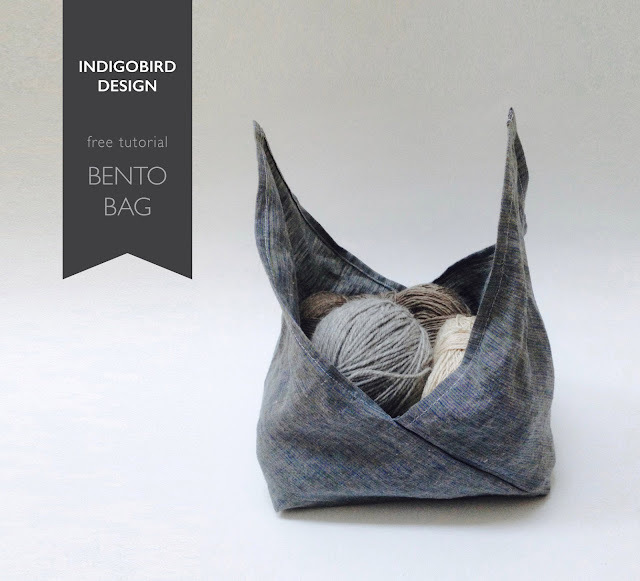 Would you mind sharing what fabric you used for this Bento Bag project? 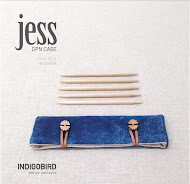 Thanks for the tutuorial, look forward to giving it a go as soon as I find a nice fabric! The fabric I used was a 100% linen fabric. I purchased it from a local fabric store a while ago. 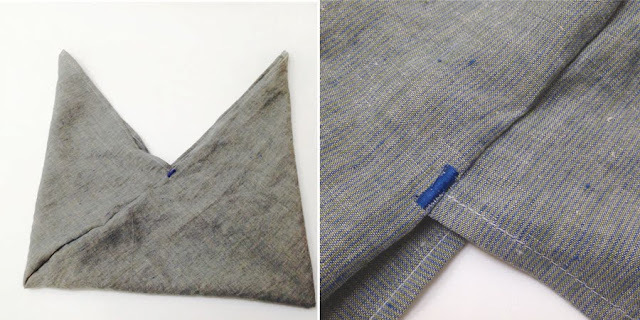 For this project it is good to use a fabric that looks good from both sides...Check out the Essex Yarn Dyed fabric collection by Robert Kaufman. 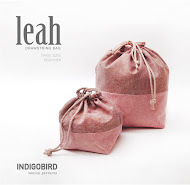 They are linen/cotton blend, a perfect fabric weight for this project, and they come in gorgeous colours. Should it be 10 by 29.5 that you cut out? Yes. This measurement includes seam allowances. 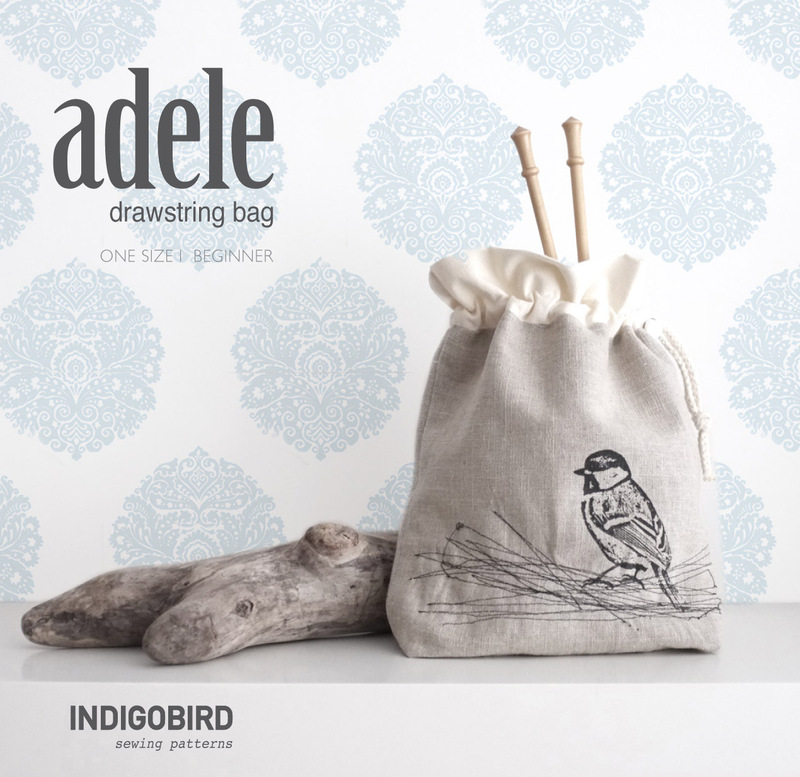 Also, if you want to make a larger bag, check out my new website [indigobird.ca] for updated tutorial & additional sizes.